FILE - Natalie Pereira (C) queues to go through migration before her move to the U.S. with her family, after winning the Green Card lottery, at the Maiquetia airport in Caracas, April 8, 2014. What could be more American: enter a lottery, win a chance at U.S. citizenship. Sure, the likelihood of getting the Diversity Immigrant Visa is slim — about 0.3 percent. But if you’re one of the 14 million applicants to win one of about 50,000 spots, you’re on your way to becoming an American. U.S. 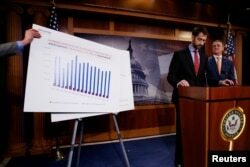 Senator Tom Cotton (R-AR) (2nd R) and Senator David Perdue (R-GA) (R) unveil legislation aimed at curbing legal immigration by halving the number of legal immigrants admitted into the United States, at the U.S. Capitol in Washington, Feb. 7, 2017. The 22-year-old visa lottery has been on the chopping block before in legislation sponsored by Republicans and Democrats as recently as last year. But it was rolled into broader bills that never became laws. Now with a Republican-controlled Congress and a president who has focused on immigration changes from his first week in office, the program is once again at risk with the Reforming American Immigration for Strong Employment (RAISE) Act. While research has shown that correlation is tenuous, there are other anti-diversity visa arguments. The State Department improved the application process to reduce the number of people who submit multiple applications in the same year — an automatic disqualification; it also warns against businesses charging aspiring immigrants to submit lottery applications on their behalf, since applying for the lottery is free. For would-be Americans who don’t have family in the U.S., or an employer to sponsor them, or who aren’t refugees, the diversity visa is the only option. It’s a visa that sounds like it could have been created by Oprah, a feel-good program that evokes the American dream abroad. It requires a high school degree or a few years of work experience just to qualify. If the application is valid, your number is chosen and you pass the other requirements for immigrants, you still need the money to get to the U.S. It's a small portion of immigration to the U.S. every year, but larger than other cornerstones of the program, like employment-based immigrant visas. “For the cynics: It's not everybody who you get on your shores - it's people who have access to that technology," says Carolien Hardenbol, a diversity visa recipient from the Netherlands. She moved to the U.S. in the late 1990s from the Netherlands with her husband, new parents with advanced degrees and a sense of adventure. Uncertain they would be sponsored for permanent residency through work, they applied for the diversity lottery — and her husband won. At its core, the diversity lottery was designed — as the name suggests — to diversify the immigrant stream to the U.S. from countries with lower immigration rates. A country that sends more than 50,000 immigrants to the U.S. in the previous five years will be excluded from the eligibility list. The visa succeed in that goal, says Hardenbol, because it “positions the United States in the center of ensuring diversity." "Without diversity there would be no United States of America," she added. It also reflects the policy suggestions of immigration restrictionist groups. Nixing the diversity visa has long been a central part of the platform for groups who want significantly to reduce immigration to the U.S.
Maurice Goldman, an immigration lawyer in Tucson, Arizona, said he once felt the diversity visa was a negotiable issue in the bigger picture of immigration reform. He changed his mind after a fellow attorney at a conference shared how he received the diversity lottery, and likely would not be working in the U.S. legal community without it. “When he got up and said that, he convinced me,” Goldman says. Unlike some earlier attempts to terminate the diversity visa, which would have reapportioned those visas to other categories, for example, by increasing employment-based visas — the RAISE Act offers no such balance. It calls for cuts in family preference visas, refugee admissions, and the diversity lottery, while only adding a new W visa, to allow the foreign-born parents of adult U.S. citizens to visit for renewable five-year periods, without a path to citizenship or work approval. Some immigration supporters believe the 50,000 visas could be better used. The RAISE Act has been referred to the Senate Judiciary Committee for review. Follow legislative actions on S. 354 here here and H.R.1178 - SAFE for America Act here.